To ensure your child's safety, the following guidelines for morning drop-off and afternoon pickup have been implemented. With everyone's cooperation, these procedures will help guarantee safety around the parking lot. 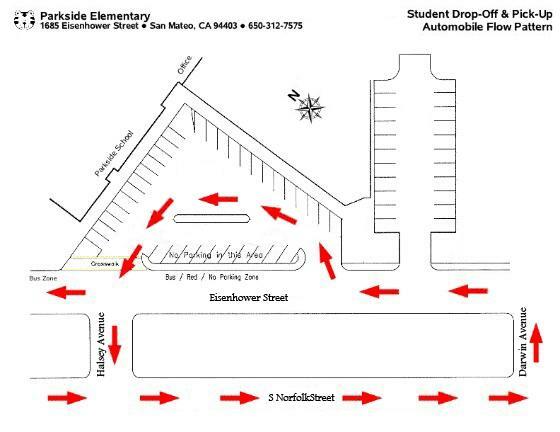 Please use the map below and follow the Automobile Flow Pattern to ensure a smooth and safe environment for everyone at Parkside. Children who arrive early in the A.M. should stay near the office and LGI until 8:00 bell rings. Children should WALK their bike or scooter or skateboard to the bike rack before & after school. After school young children may wait for older children on benches in front of the school. Older siblings may not wait outside the classrooms. Children may not play after school in areas unsupervised by Parkside staff such as on the planters or playgrounds. AFTERNOON PICK-UP children will stand behind the traffic island (NOT ON THE ISLAND) and watch QUIETLY for their ride. This is not a place to play. The traffic flow pattern works efficiently if you exit the driveway to Halsey and continue out to Norfolk. If you need to circle, please exit straight ahead on Halsey, make a left onto Norfolk, make a left onto Darwin and another left onto Eisenhower (See traffic ). Please do not exit the driveway and turn left onto Eisenhower, as this impedes the flow of traffic and creates a HUGE traffic jam. Police may ticket violators; there is a legal sign posted. Alternative to circling: park on the street (preferably NOT Halsey) and walk to and from school. The RED ZONES are BUS ZONES. You are NOT ALLOWED to PARK, STAND OR WAIT in the BUS ZONE! These zones are also used to provide emergency vehicle access. Children are not allowed to walk in the drop-off / pickup zone - NO EXCEPTIONS. Any child crossing in the drive-thru area will have their names taken by the Safety Patrol and receive detention. Children are to walk in the crosswalks. Please instruct anyone picking up your children of the rule. DO NOT PARK ON THE CROSSWALKS! It blocks the view of safety patrol signs. Please do not backup out of the Staff Parking Lot. We have it coned off for safety of children walking to the island and for smooth flow of traffic. Enter and turn at the ends of the lot. There are pedestrians and Safety Patrol that cross here with small children. These are guidelines to safety. They are instituted to protect children from increasing traffic congestion at school. With everyone's cooperation we can have another casualty-free year. Thank you for your continued support, patience, and cooperation.